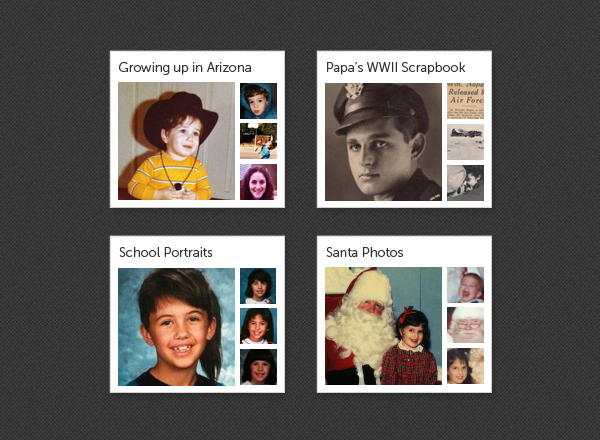 1000Memories, the startup behind the ShoeBox iPhone application, which lets you “scan” old photographs and post them online using your mobile phone’s camera, is now introducing a new feature to help you better organize your digital collections. The feature is called, not surprisingly, “Shoeboxes,” and it’s meant to become the digital equivalent of the actual shoeboxes you have stuffed with photos sitting in your closets. But scanning in a shoebox’s worth of photographs using an iPhone’s camera would be highly inefficient, of course. To help speed things up, 1000Memories is also announcing a partnership with ScanCafe, allowing you to ship off your photos for offsite digitization. This startup speaks to me, personally, because I somehow ended up with my entire family’s photo collection. I have all my parents’ photos from my childhood through graduation, as well as all the photos that once belonged to my grandmother. I actually do have shoeboxes stacked on top of shoeboxes sitting in my closet. (That’s them, to the right). 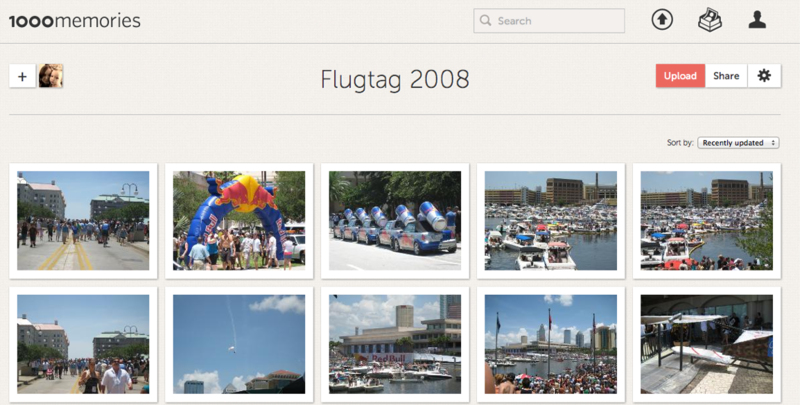 When the ShoeBox iPhone app launched, I enjoyed pulling out a few of the old photos and sharing them on Facebook, but I soon realized that there were so many photos I wanted to share, I would actually have to look into digitization services. I had just started researching this when 1000Memories’ news hit. Perfect timing. Of those services I had checked into (e.g. Digmypics, Fotobridge, ScanMyPhotos, Scandigital, and Digmypics, to name a few), ScanCafe’s pricing’s of $0.29 seemed competitive, sometimes even cheaper. However, through the 1000Memories’ partnership, it’s even lower – all packages offered are under the $0.29 rack rate and it’s just $0.22 for large volume orders (1,000 scans). Once digitized, either through the ScanCafe service, the mobile app or even uploaded from your hard drive(s), you can organize the photos into collaborative “shoeboxes” which are shared exclusively with those you invite. Although you could share these photos on Facebook, the idea is that the Shoeboxes are a bit more private – instead of having to carefully set privacy controls on them to make sure only those people you want to have access can view them, the boxes are for your eyes only unless you deliberately add someone to them. It also makes more sense, in my opinion, to keep some of those photos off Facebook because, frankly, no one is interested in two decades’ worth of your childhood in the form of Kodak prints, except for you and your family. However, the focus for these new Shoeboxes doesn’t have to be the past only. Modern uses could include sharing wedding or party pictures, baby photos, vacation photos and anything else where sharing is meant to be more private. 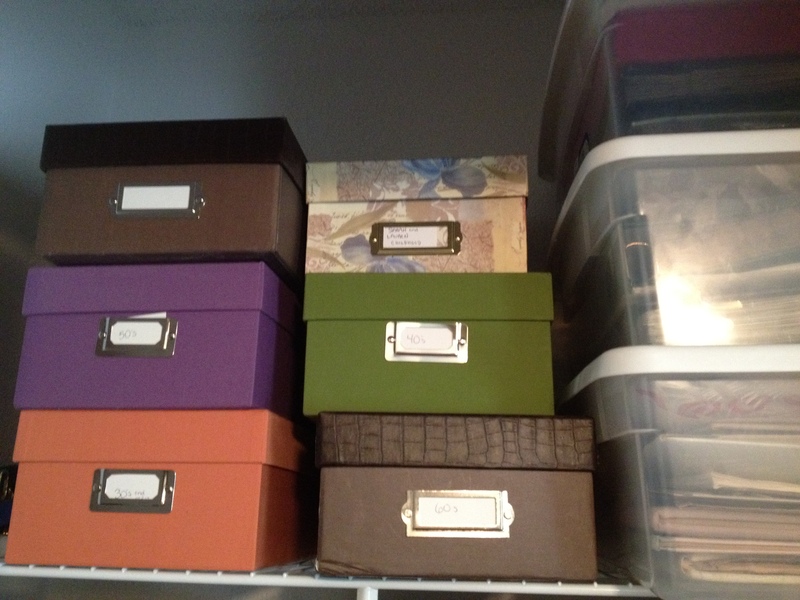 I’ve already started building my Shoeboxes in anticipation of my forthcoming digitized collections. I’d show you ’em, but I don’t really know you that well. 1000Memories founder, Rudy Adler, is not so shy. You can see his collection above. 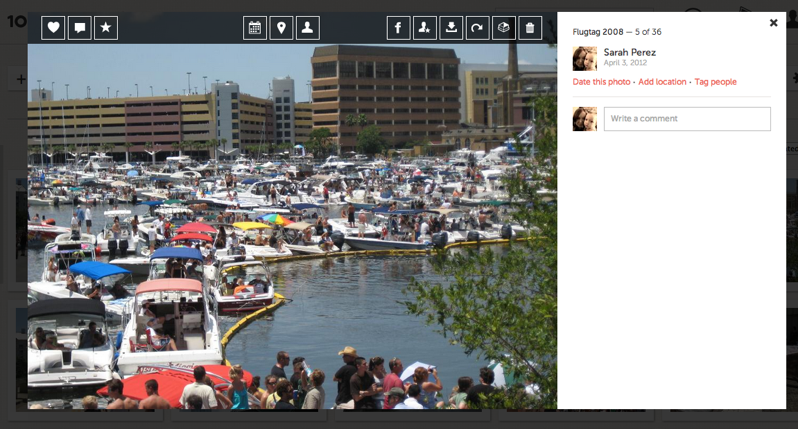 Below, some of my less-than-private photos from Flugtag a few years ago, to give you an idea. The new website introducing the ScanCafe service and the Shoeboxes goes live this morning on the 1000Memories homepage.